The joy of publishing a food blog is that suddenly the right side of the brain grows much larger than the left side and moving in the kitchen becomes increasingly fun and playful. My right hemisphere told me to grill watermelon slices for dinner and my left hemisphere was so asleep it had no time to say, “no, no, no, watermelon has to be COLD, “ or” grilling melon is illogical.” But, seafood and fruit is a natural. I didn’t search the food blogs or ravage through my many cook books and food magazines. 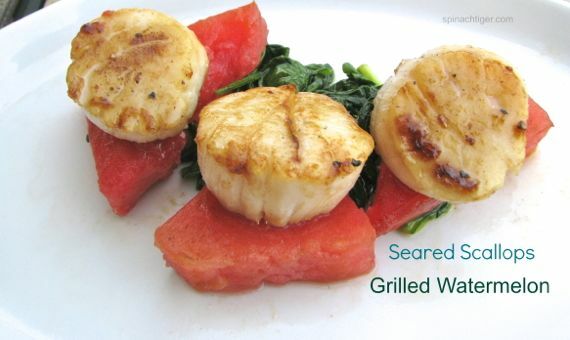 I just thought it would be fun to grill some watermelon as a side dish to my sea scallops. I had no clue as to how to grill it, or how to season it, so I didn’t do much more than salt and a hot grill, but I’m sure you could take this in many directions. Grilled watermelon, a little spinach cooked in garlic and olive oil , perfectly seared scallops and we have a sensible hot night in the south dinner that takes about 15 minutes, from beginning to end. Did I say sensible? Well sensible in that this is healthy and a much better choice than pizza delivery. But, still, there is a child-like flavor and attitude to this dish. Makes me think about the kind of food kids put together before people start teaching them from recipe books. Still, I wondered how the watermelon would fare on a hot grill. Would it fall apart or lose its essence? The first bite was juicy, hot, firm, and did not overpower the sweetness of perfectly cooked scallops. Did I use that word “perfect “ again? After watching Top Chef and Hell’s Kitchen, I am only all too aware of scallops not cooked properly. When I am making scallops I feel like I have the eyes of the judges or worse, Gordon Ramsay, looking at me waiting to pounce and spit in my face because I stupidly turned the scallops into rubber. Perhaps this fear has given me the patience and determination to make the perfect scallop, caramelized, yet tender and earning my due place inside a kitchen. I recall that a few of the contestants on Top Chef did not pull the muscle off the scallop. HOW is that possible that they didn’t know? Even I would agree that the most perfectly cooked, seared, tender, sweet scallop that still has the rubbery, chewy muscle attached needs to be tossed across the room. Thus, a sweet satisfaction every time my scallops turn out properly cooked. I can let out a big sigh of relief. And, now I brag, not because I am a know it all cook, but because I am over my scallopphobia! I think I have crossed over the “take a first bite with my eyes closed” to see if they are judge worthy. Sure, I have made scallops, here and here, but today I crossed the totally consistent perfection line because this makes three times in a row of the perfect Top Chef worthy scallop. I discovered in my research that I am not alone in this scallop intenseness. Sippity Sup, a fellow food blogger, shares fascinating and funny information about reasons for scallop failure citing the additive STP as the most likely culprit. He offers some recommendations on how to purchase and cook scallops that is worth a trip to his site. And, there are other reasons for my commitment to scallop perfection. Wild scallops are expensive and I only eat wild scallops, so cooking them improperly is a real ouch. And, most importantly, scallops are my husband’s favorite food in the whole world. A few minutes of standing over a hot saute pan and delivering up these sea beauties will get me lots of points, cappuccino in bed, dishes done, and a Kitchen Aid maybe just maybe? Oops, I forgot he reads my blog, but I didn’t come up with this tag line for nothing. Surprisingly well. It’s a sweet meat upon a sweet fruit leveled with a generous dash of sea salt, taking in completely different textures, resulting in a dinner that is beautiful to look at and thirst quenching. But, the real test..is it “memorable” and the next day, we wanted it again. Is there a new combination that you have just tried? Is there a food or dish you need to conquer? Tell me about it here. Perhaps we can conquer it together! A wonderful mix of flavors and textures, seared scallops and grilled watermelon. watermelon slices, cut into ¼ to ½ inch slices. Bring scallops to near room temperature. Ice cold scallops won’t cook inside. Remove muscle, a little rubbery piece on side of scallop. Use a pan (not non-stick) that is large enough to give each scallop plenty of room. I use all-clad 12 inch pan. When scallops are crowded, they steam, instead of caramelize. Add enough butter in pre-heated pan that when melted pan is covered. Add in a little bit of olive oil. Add scallops to hot pan, and do not try to turn until they are brown and no longer stick, 4-6 minutes. Turn and cook for a few more minutes. Immediately remove from pan. The watermelon was doused a tiny drizzle of olive oil and salt, and grilled on high, until I decided it gets grill marks. Or try my Blackberry Glazed Watermelon with Lavender Sea Salt on a day I did get fancy.